Find My Workspace lists over 95% of the business centres market in Bradley Stoke. Simply click Request Quote to check pricing for one office, or Add to Basket for multiple offices. Approx 820 sq. 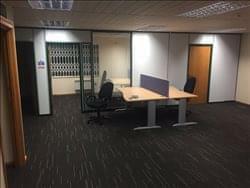 ft. office space available to rent in Bradley Stoke (Woodlands area). Refurbished, desks and chairs in situ. The office is offered either furnished, unfurnished or fully serviced basis. Price advertised is for unfurnished & all bills excluded, happy to negotiate on other contract types. The office can comfortably accommodate 6-10 people plus storage and is also partitioned to offer an additional meeting / board room or additional office. You also have private kitchen and bathroom facilities. We also offer the use of meeting and break out rooms on the 1st floor where there is projection and large screen equipment and a board room that comfortably holds a meeting for up to 20 people. The break out room has a TV, sofa, lunch tables, kitchenette and a running machine and cross trainer. Use of the boardroom and break out rooms to be negotiated with us as per your requirements. There is also coffee shop across the road, with local pubs and an Indian restaurant a stones throw away. The office is offered with the added advantage of two dedicated parking spaces. Terms from 12 months to three years available with the 1st month free of charge, rent is paid monthly and will or will not included utilities and management company charges dependent on contract type. A deposit of two months rent will be required. 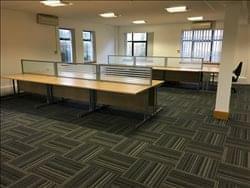 This centre offers around 1000 square feet of ground floor newly refurbished high quality office space available ideally to let as two serviced offices, but can be partitioned to suit. Situated on the attractively landscaped and high quality office Park. Additionally you will have access via a common reception area to shared kitchenette and shower facilities, plus chargeable meeting room and large board room. You will benefit from included secure 500mb broadband (can be increased to Gigabit) and very fast WiFi for complete IT flexibility, there is also an advanced VOIP phone system available. Dedicated parking spaces available at additional cost though on street parking is normally ample closer by. To obtain information for your selected Gloucestershire Business Centres, please tick the "Add to basket" box for each office you prefer and complete the form below. We will then send a detailed report via email.